Beijing has introduced new traffic rules to combat the massive smog that has cloaked the Chinese capital for years. When city authorities issue a ‘red alert’, a number of cars will be banned on the roads and heavy vehicles completely banished. Four types of pollution alerts, blue, yellow, orange and red, will be issued on ‘heavy pollution’ days, according to Beijing's Environmental Protection Bureau. The term will be applied if the Air Quality Index tops 200. Orange and red alerts are to be announced 24 hours before these heavily polluted days, Yao Hui, deputy head of the bureau, told Xinhua news agency. Vehicles bearing odd- and even-numbered license plates will be allowed on the streets on alternating days during red alerts. Also 30 percent of government cars will be banished from the city traffic irrespective of their plate numbers. All factories will be shut down during orange alerts. Heavy vehicles, such as construction trucks, will also be completely banned during orange and red alerts. The same system is applied to battle another big city problem – traffic jams. "With the new plan, strong pollution measures could be implemented more often and public health - particularly that of children - can be protected more effectively,” Ma Jun, director of the Institute of Public and Environmental based in Beijing, told the Global Times. “The only concern is whether the government will be determined enough to issue red alerts considering the difficulties in implementing the controversial car ban," he said. 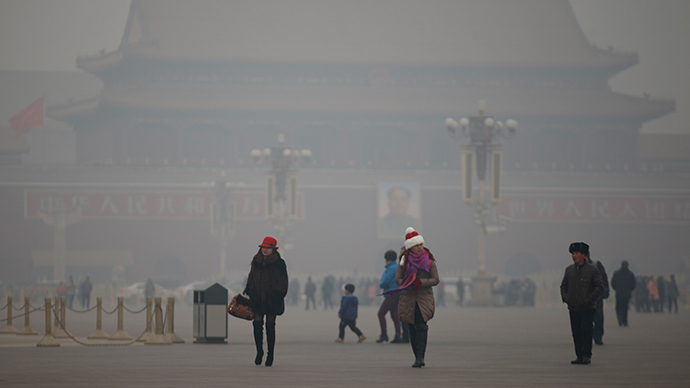 Beijing is the world's most-polluted city. A map of air quality in the capital and other Chinese cities shows that numerous locations are smog-bound. In some areas the air quality index already tops 200. On Tuesday, Plumelabs.com, a website that monitors 60 cities, indicated Beijing AQI (Air quality index) level of 176. It means that there is “critical level of pollution and harmful impacts on the general public” in the city. China has been suffering a pollution crisis for decades which has left big cities shrouded in constant smog and half the groundwater contaminated. Pollution from the coal industry alone killed 670,000 people in China in 2012, according to last year’s study by the Natural Resources Defense Council. The level of air pollution in China was more than double the national standard in 2014 with the indicators of environmental pollution over the limit in 90 percent of 161 Chinese cities. The level of small particles that pose a danger to human health, averaged 85.9 micrograms per cubic meter in 2014 in Beijing compared with the national standard of 35. Only eight of China’s 74 large cities have managed to meet official air safety standards in 2014, according to the Environmental Protection Ministry.